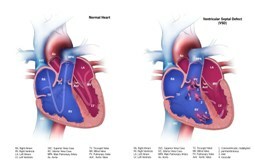 A ventricular septal defect (VSD) is a birth defect of the heart in which there is a hole in the wall (septum) that separates the two lower chambers (ventricles) of the heart. This wall also is called the ventricular septum. A ventricular septal defect happens during pregnancy if the wall that forms between the two ventricles does not fully develop, leaving a hole. 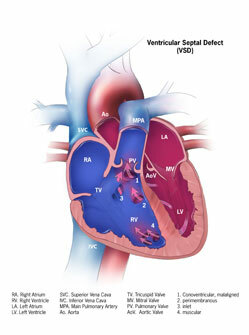 A ventricular septal defect is one type of congenital heart defect. Congenital means present at birth. In general, this is a hole where portions of the ventricular septum should meet just below the pulmonary and aortic valves. This is a hole in the upper section of the ventricular septum. This is a hole in the septum near to where the blood enters the ventricles through the tricuspid and mitral valves. This type of ventricular septal defect also might be part of another heart defect called an atrioventricular septal defect (AVSD). This is a hole in the lower, muscular part of the ventricular septum and is the most common type of ventricular septal defect. In a baby without a congenital heart defect, the right side of the heart pumps oxygen-poor blood from the heart to the lungs, and the left side of the heart pumps oxygen-rich blood to the rest of the body. In babies with a ventricular septal defect, blood often flows from the left ventricle through the ventricular septal defect to the right ventricle and into the lungs. This extra blood being pumped into the lungs forces the heart and lungs to work harder. Over time, if not repaired, this defect can increase the risk for other complications, including heart failure, high blood pressure in the lungs (called pulmonary hypertension), irregular heart rhythms (called arrhythmia), or stroke. In a recent study in Atlanta, the Centers for Disease Control and Prevention (CDC) estimated that 42 of every 10,000 babies born had a ventricular septal defect. The causes of heart defects (such as a ventricular septal defect) among most babies are unknown. Some babies have heart defects because of changes in their genes or chromosomes. Heart defects also are thought to be caused by a combination of genes and other risk factors, such as the things the mother comes in contact with in the environment or what the mother eats or drinks or the medicines the mother uses. A ventricular septal defect usually is diagnosed after a baby is born. During a physical examination the doctor might hear a distinct whooshing sound, called a heart murmur. If the doctor hears a heart murmur or other signs are present, the doctor can request one or more tests to confirm the diagnosis. The most common test is an echocardiogram, which is an ultrasound of the heart that can show problems with the structure of the heart, show how large the hole is, and show how much blood is flowing through the hole. Some children will need medicines to help strengthen the heart muscle, lower their blood pressure, and help the body get rid of extra fluid. Some babies with a ventricular septal defect become tired while feeding and do not eat enough to gain weight. To make sure babies have a healthy weight gain, a special high-calorie formula might be prescribed. Some babies become extremely tired while feeding and might need to be fed through a feeding tube. Treatments for this type of defect depend on the size of the hole and the problems it might cause. Many ventricular septal defects are small and close on their own; if the hole is small and not causing any symptoms, the doctor will check the infant regularly to ensure there are no signs of heart failure and that the hole closes on its own. If the hole does not close on its own or if it is large, further actions might need to be taken. Depending on the size of the hole, symptoms, and general health of the child, the doctor might recommend either cardiac catherization or open-heart surgery to close the hole and restore normal blood flow. After surgery, the doctor will set up regular follow-up visits to make sure that the ventricular septal defect remains closed. Most children who have a ventricular septal defect that closes (either on its own or with surgery) live healthy lives.